A purposefully prejudicial analysis of Michael Skakel and his testimony. Much like his brother, Tommy, Michael Skakel has made some revelatory alterations and amendments to our account of his activities and whereabouts on the night of October 30, 1995. [sic] The parallels neither begin nor end there. 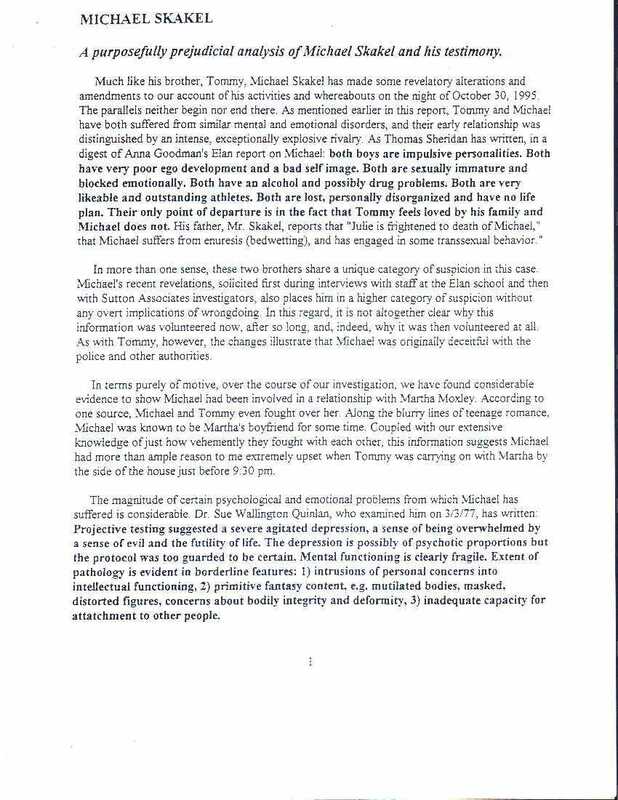 As mentioned earlier in this report, Tommy and Michael have both suffered from similar mental and emotional disorders, and their early relationship was distinguished by an intense, exceptionally explosive rivalry. As Thomas Sheridan has written, in a digest of Anna Goodman's Elan report on Michael: both boys are impulsive personalities. Both have very poor ego development and a bad self image. Both are sexually immature and blocked emotionally. Both have an alcohol and possibly drug problems. Both are very likable and outstanding athletes. Both are lost, personally disorganized and have no life plan. Their only point of departure is in the fact that Tommy feels loved by his family and Michael does not. His father, Mr. Skakel, reports that, "Julie is frightened to death of Michael," that Michael suffers from enuresis (bedwetting), and has engaged in some transsexual behavior." In more than one sense, these two brothers share a unique category of suspicion in this case. Michael's recent revelations, solicited first during interviews with staff at the Elan school and then with Sutton Associates investigators, also places him in a higher category of suspicion without any overt implications of wrongdoing. In this regard, it is not altogether clear why this information was volunteered now, after so long, and indeed, why it was then volunteered at all. As with Tommy, however, the changes illustrate that Michael was originally deceitful with the police and other authorities. In terms purely of motive, over the course of our investigation, we have found considerable evidence to show Michael had been involved in a relationship with Martha Moxley. According to one source, Michael and Tommy even fought over her. Along the blurry lines of teenage romance, Michael was known to be Martha's boyfriend for some time. Coupled with our extensive knowledge of just how vehemently they fought with each other, this information suggests Michael had more than ample reason to me [WW] extremely upset when Tommy was carrying on with Martha by the side of the house just before 9:30 pm. The magnitude of certain psychological and emotional problems from which Michael has suffered is considerable. Dr. Sue Wallington Quinlan, who examined him on 3/3/77, has written: Projective testing suggested a severe agitated depression, a sense of being overwhelmed by a sense of evil and the futility of life. The depression is possibly of psychotic proportions but the protocol was too guarded to be certain. Mental functioning is clearly fragile. Extent of pathology is evident in borderline features: 1) intrusions of personal concerns into intellectual functioning, 2) primitive fantasy content, e.g. mutilated bodies, masked, distorted figures, concerns about bodily integrity and deformity, 3) inadequate capacity for attatchment [sp] to other people.